EAGLEHAWK is a powerful Hardware and Software platform designed to manage HVAC and non-HVAC Systems (e.g. lighting, security, life safety) in a building and across multiple buildings. It therefore supports all common communication protools, such as BACnet, LON, Modbus, M-BUS, KNX IP, Fidelio, SNMP, C-Bus and many more. Eaglehawk allows to make use of the CentraLine Application Library, which ensures unparalleled energy Efficiency as well as maximum application reliability. This ensures that International Standards like the EN 15232 are met. • Onboard communication inputs/outputs: Dual Ethernet 10/100Mbps, 2 RS485 ports, 1 RS232 port. • Onboard HMI: Integrated HMI with graphic icons, push-and-turn wheel and direct access buttons.Configurable operation menu, which among many more includes configurable fast access lists that can contain data-points, parameters and time schedules.The onboard HMI allows for adaptation of the operating menu to application- specific needs. The onboard HMI is independent from the BMS network and hence suitable for emergency operation as is required in many project specifications. • Detached HMI: CLEAHMI21 see also separate description further down. Same as above, but as a separate unit. Allows for mounting through panel doors, onto walls, magnetic mounting and hand-held. 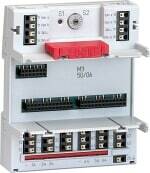 • Panel-Bus input modules available for: measurement of temperature, relative humidity, pressure etc. ; contact status from relays, thermostats; counters etc. • Panel-Bus output modules available for: control devices like servomotors, switching devices like pumps, ventilators etc. EAGLEHAWK Controller with STANDARD Version Lisence for 255 Panel-Bus/Onboard IO points, 100 open points and first year of Software Maintenance Agreement. EAGLEHAWK Controller with SMALL Version Lisence for 100 Open points, BUT NO PANEL BUS POINTS. Without Software Maintenance Agreement. External HMI. Mounting in cabinet front door, or with CLEAHMI-BASE: on wall/metal surface or used as handheld. Connection with Ethernet cable, max. 5m.